COLONEL A ELZEY (JONES), JR.
Major A Elzey, Jr., artillery, Confederate States Army, was appointed colonel, 1st Maryland Infantry, at Richmond, Henrico County, Virginia, on 17 June, 1861, and was assigned to command the Fourth Brigade, Army of the Shenandoah, at Winchester, Frederick County, Virginia, on 24 June, 1861. Colonel A Elzey, Jr., 1st Maryland Infantry, was appointed brigadier general, Confederate States Army, on 28 August, 1861, dated 21 July, 1861. Captain G H Steuart, cavalry, Confederate States Army, was appointed lieutenant colonel, 1st Maryland Infantry, at Winchester, Frederick County, Virginia, on 17 June, 1861, and colonel on 4 September, 1861, dated 21 July, 1861. Captain B T Johnson, 1st Maryland Infantry, Company A, was appointed major, 1st Maryland Infantry, at Winchester, Frederick County, Virginia, on 17 June, 1861, and lieutenant colonel on 4 September, 1861, dated 21 July, 1861. The company was organised at Frederick, Frederick County, Maryland, under the command of Captain B T Johnson, on 19 April, 1861, and arrived at Point of Rocks, Frederick County, Maryland, on 8 May, 1861. The company was mustered in Confederate service for the war at Harpers Ferry, Jefferson County, Virginia, by Lieutenant Colonel & Assistant Adjutant General G Deas, Confederate States Army, on 21 May, 1861, and Captain B T Johnson, 1st Maryland Infantry, Company A, was appointed major, 1st Maryland Infantry, on 17 June, 1861. Private W W Goldsborough, 1st Maryland Infantry, Company C (2nd), was appointed captain, 1st Maryland Infantry, Company A, on 25 June, 1861. The company arrived at Point of Rocks, Frederick County, Maryland, on 9 May, 1861, and was mustered in Confederate service for the war at Harpers Ferry, Jefferson County, Virginia, by Lieutenant Colonel & Assistant Adjutant General G Deas, Confederate States Army, on 21 May, 1861. The company was mustered in Confederate service for the war at Harpers Ferry, Jefferson County, Virginia, by Lieutenant Colonel & Assistant Adjutant General G Deas, Confederate States Army, on 22 May, 1861, and was disbanded and assigned to the 1st Maryland Infantry at Camp Johnston, in the vicinity of J M Mason's House or Selma, half a mile west of Winchester, Frederick County, Virginia, on 25 June, 1861. Captain F S Price, 1st Maryland Infantry, Company C (1st), was appointed sergeant, 1st Maryland Infantry, Company C (2nd), at Camp Johnston, in the vicinity of J M Mason's House or Selma, half a mile west of Winchester, Frederick County, Virginia, the same day. The company was accepted in state of Virginia service at Weston & Williams Store, on Pearl Street, Richmond, Henrico County, Virginia, on 16 May, 1861, and was mustered in state of Virginia service for one year by Colonel J B Baldwin, Provisional Army of Virginia, as Weston's Battalion Infantry, Company A, at Richmond, Henrico County, Virginia, on 17 May, 1861 (See Weston's (Maryland Line) Battalion Infantry). The company was ordered to proceed by the Virginia Central Railroad to Winchester, Virginia, in the morning on 23 June, 1861, and was assigned to the 1st Maryland Infantry, Company C (2nd), at Camp Johnston, in the vicinity of J M Mason's House or Selma, half a mile west of Winchester, Frederick County, Virginia, on 25 June, 1861. Captain E R Dorsey, 1st Maryland Infantry, Company C (2nd), was appointed major, 1st Maryland Infantry, on 4 September, 1861, dated 21 July, 1861, and was mustered out on 19 June, 1862. The company was mustered in Confederate service for the war at Harpers Ferry, Jefferson County, Virginia, by Lieutenant Colonel & Assistant Adjutant General G Deas, Confederate States Army, on 22 May, 1861, and First Lieutenant G W Booth, 1st Maryland Infantry, Company D, was assigned to command the 1st Maryland Infantry, Company F, as Captain T L Smith, 1st Maryland Infantry, Company F, was disabled with sickness in the morning on 19 July, 1861. The company was ordered to Harpers Ferry, Jefferson County, Virginia, on 13 May, 1861, and was mustered in Confederate service for the war by Lieutenant Colonel & Assistant Adjutant General G Deas, Confederate States Army, on 22 May, 1861. Captain H McCoy, 1st Maryland Infantry, Company E, resigned on 18 August, 1861, and First Lieutenant E O'Brien, 1st Maryland Infantry, Company E, was appointed captain, 1st Maryland Infantry, Company E, the same day. The company was mustered in Confederate service for the war at Harpers Ferry, Jefferson County, Virginia, by Lieutenant Colonel & Assistant Adjutant General G Deas, Confederate States Army, on 23 May, 1861, and was disbanded and assigned to the 1st Maryland Infantry at Camp Johnston, in the vicinity of J M Mason's House or Selma, half a mile west of Winchester, Frederick County, Virginia, on 25 June, 1861. Captain T H Holbrook, 1st Maryland Infantry, Company F (1st), was appointed first lieutenant, 1st Maryland Infantry, Company F (2nd), at Camp Johnston, in the vicinity of J M Mason's House or Selma, half a mile west of Winchester, Frederick County, Virginia, the same day. The company was organised at Camp Johnston, in the vicinity of J M Mason's House or Selma, half a mile west of Winchester, Frederick County, Virginia, on 25 June, 1861, and Second Lieutenant J L Smith, 1st Maryland Infantry, Company G, was appointed captain, 1st Maryland Infantry, Company F (2nd), on 25 June, 1861, dated 18 August, 1861. Captain T H Holbrook, 1st Maryland Infantry, Company F (1st), was appointed first lieutenant, 1st Maryland Infantry, Company F (2nd), the same day and First Lieutenant G W Booth, 1st Maryland Infantry, Company D, was assigned to command the company as Captain J L Smith, 1st Maryland Infantry, Company F (2nd), was disabled with sickness in the morning on 19 July, 1861. The company was mustered in Confederate service for the war at Harpers Ferry, Jefferson County, Virginia, by Lieutenant Colonel & Assistant Adjutant General G Deas, Confederate States Army, on 22 May, 1861. Second Lieutenant T L Smith, 1st Maryland Infantry, Company G, was assigned to command the 1st Maryland Infantry, Company F (2nd), at Winchester, Frederick County, Virginia, on 25 June, 1861, and was appointed captain, 1st Maryland Infantry, Company F (2nd), on 18 August, 1861. The company was mustered in Confederate service for the war at Harpers Ferry, Jefferson County, Virginia, by Lieutenant Colonel & Assistant Adjutant General G Deas, Confederate States Army, on 22 May, 1861, and was disbanded and assigned to the 1st Maryland Infantry at Camp Johnston, in the vicinity of J M Mason's House or Selma, half a mile west of Winchester, Frederick County, Virginia, on 25 June, 1861. Captain H Wellmore, 1st Maryland Infantry, Company H (1st), was appointed private, 1st Maryland Infantry, Company E, at Camp Johnston, in the vicinity of J M Mason's House or Selma, half a mile west of Winchester, Frederick County, Virginia, the same day. The company was accepted in state (Virginia) service at Weston & Williams Store, on Pearl Street, Richmond, Henrico County, Virginia, in the morning on 12 June, 1861, and was mustered in state of Virginia service for one year as Weston's Battalion Infantry, Company D, at Richmond, Henrico County, Virginia, on 18 June, 1861 (See Weston's (Maryland Line) Battalion Infantry). The company was ordered to proceed by the Virginia Central Railroad to Winchester, Frederick County, Virginia, on 23 June, 1861, and was assigned to the 1st Maryland Infantry, Company H (2nd), at Camp Johnston, in the vicinity of J M Mason's House or Selma, half a mile west of Winchester, Frederick County, Virginia, on 25 June, 1861. The company was mustered out on 19 June, 1862. The company was accepted in state (Virginia) service at Weston & Williams Store, on Pearl Street, Richmond, Henrico County, Virginia, on 12 June, 1861, and was mustered in state of Virginia service for one year as Weston's Battalion Infantry, Company C, at Richmond, Henrico County, Virginia, on 15 June, 1861 (See Weston's (Maryland Line) Battalion Infantry). The company was was ordered to proceed by the Virginia Central Railroad to Manassas Junction, Prince William County, Virginia, by Special Orders No.238, Paragraph II, Headquarters, Virginia Forces, Richmond, Henrico County, Virginia, on 31 July, 1861, and arrived at Fairfax Courthouse, Fairfax County, Virginia, on 21 August, 1861. Colonel C W Brush, 53rd Maryland Militia, was disabled by a wound to the hand after an accidental discharge of his pistol on 20 April, 1861, and Brevet Colonel & Lieutenant Colonel B Huger, United States Army, was assigned to command the 51st Maryland Militia and resigned on 22 April, 1861. Lieutenant Colonel L Erving, 53rd Maryland Militia, died of consumption. Major C E Phelps, 53rd Maryland Militia, resigned on 19 April, 1861. Captain J L Clarke organised the 21st Virginia Infantry, Company B, at Richmond, Henrico County, Virginia, in May 1861. Captain W H Murray organised the 1st Maryland Infantry, Company H (2nd), at Richmond, Henrico County, Virginia, in May 1861. The company was assigned on 11 June, 1860. The Maryland Guard Battalion Infantry was disbanded on 16 May, 1861. "The Governor , mayor, and President of the Board of Police, at noon caused an order for the instant assembling of the military of the city, with instructions to repel the march of any more Northern troops through the city. In a short time thereafter, Gen. Edgerton appeared on the street and told the people what had been done, and it gave satisfaction. In the afternoon, the First Light Division was on Calvert street, fully armed and equipped. The Battlion of Maryland Guards, Col. Brush, was out in full force. The Battalion of Baltimore City Guards, under Lt. Col. Warner; three companies of Independent Greys; two companies of Law Greys; the Shields Guards; the Jackson Guards; the Wells and McComas Rifles, and the Eagle Artillery. The whole division formed on Calvert street. Gens. Watkins and Egerton, Col. Peters, Majors Fox and Carr, Quartermaster Scott and Adjutant Swinney, were the regimental officers, besides Col. Brusn and Lieut. Col. Warner." "About 400 troops are supposed to be at the Point of Rocks, and are strongly posted on the Virginia side. They comprise two companies of artillery from Leesburg and Staunton, two companies of cavalry from Fauquier and Leesburg, together with Captain Bradley T Johnson's Frederick company and a company of Baltimore 'Southern volunteers,' which reached there this morning." "A number of the Maryland Guard of the city of Baltimore passed up the Orange and Alexandria Railroad yesterday. They report that over one thousand Baltimoreans will unite with the army of the Confederate States." "A portion of the Marylanders now in this city, formerly connected with the Maryland Guards and Baltimore City Guard, met yesterday morning and effected an organisation for operations during the present war. The company formed numbers some 65 or 70 men of the most effective sort, who are eager to be at work in the good cause of redeeming Southern rights. The election for officers was held at their barracks, on Pearl street. Lieut. E. R. Dorsey, formerly of the battalion of Baltimore City Guards, was chosen Captain, S. H. Stuart, First Lieutenant, and R. Carter Smith , (late of the Maryland Guard,) Second Lieutenant. The company is tyled Company A, First Regiment Maryland Line Virginia Volunteers.."
"We learn from the Richmond Whig, that the first company of the first battalion of Maryland Volunteers was organised in this city, on Thursday, by the election of E. R. Dorsey, late Lieutenant of the Baltimore City Guard, as Captain; S. H. Stewart, of the same corps, as first Lieutenant, and R. Carter Smith, of the Maryland Guard, as second Lieutenant. The company comprises about one hundred athletic young men, of each of whom it may be truthfully said, 'he's every inch a soldier.' Several other companies of Baltimoreans will be organised here." "By an order issued by Francis J. Thomas, Col. commanding the brigade of volunteers from Maryland, arriving in this city, will report themselves, immediately on their arrival, to Major Weston, who will take forthwith the proper steps to complete their organisation into companies. Those arriving at other points on the Potomac, will report to the senior officer from Maryland nearest to them, who will carry out the same instructions." "Company C, of the Maryland Line, organised yesterday, at the store of Messrs. Weston & Williams, by the selection of Micharl S. Robertson, Captain; Hugh Mitchell, First Lieutenant; H. L. Bean, Second Lieutenant. The company is composed of natives of Southern Maryland counties. Company D, of the Maryland Line, also organised at the same place yesterday, by choosing Wm. H. Murray, Esq., Captain. Both companies are attached to Major J. A. Weston's battalion." First and Second Maryland Infantry, C.S.A, by R. J. Driver, Jr.
"Within a week Dorsey's company and our own received orders to proceed to Winchester to join the six Maryland companies which had been formed at Harper's Ferry. Lyle Clarke's company preferred to remain and attach itself elsewhere. We left a new company forming under Captain Michael Stone Robertson, of Charles County." "We arrived at the railroad junction, a few hundred yards west of the station, about 1 p.m. and immediately disembarking, thre off our knapsacks into a pile and formed in line. Colonel Elzey galloped down the front, his eyes sparkling, followed by General Kirby Smith who with the back of his hand raised to the front of his cap, exclaimed, 'This is the signal, men, the watchword is Sumpter;' this was to distinguish friend from foe." "Once more this noble woman was equal to the emergency, and very soon, and that entirely through her own exertions, the men were clad in neatly fitting grey uniforms." "The First Maryland, Thirteenth Virginia, Tenth Virginia and Third Tennessee were formed into a brigade , known as the Fourth, to be attached to another brigade to form a division, and to be commanded by General E. Kriby Smith. In the absence of a brigadier-general, Colonel Armold Elzey, of the First Maryland, and the senior Colonel, assumed command, and it was known as Elzey's brigade." "Company I, Captain Robertson, which we had left organising in Richmond, was added to the regiment, which now presented a vert handsome appearence on dress parade, numbering about 700, more than any time before ib afterwards." "The first Maryland Battalion, infantry, was formed at Harper's Ferry in May, 1861, and became a regiment in June following, by the addition of more companies." "The First Maryland Regiment was organised in June, 1861. On the 16th day of that month, commissions were issued to Elzey as Colonel, to George H Steuart, late Captain of cavalry, U S A, as Lieutenant-Colonel, and to Bradley T Johnson as Major. Colonel Elzey joined his regiment at Winchester, about June 20th. He was immediately assigned to a Brigade, consisting of the First Maryland, under Lieutenant-Colonel Steuart; 13th Infantry, Colonel A P Hill, (afterwards Brevet-General Hill); 10th Virginia, Colonel Gibbons, and the 3d Tennessee, Colonel Vaughan." "General Elzey and his officers were mounted, having taken their horses with them. The field officers of the Brigade were, however, afoot." "The regular uniform finally adopted by the Guards was that known as Zouave, or French Zouave. It was blue in colour, light in weight, loose fitting, and bright, perhaps rather brilliant, and while it might have been detracted from solidity in appearance, yet it admitted of great freedom and quickness in movement and action, features that commended themselves very highly to most men." "By 10 P.M. Saturday, 20 July, when the train returned to Piedmont, Smith's Fifth Brigade had not yet reached the station, but Elzey's had, partys of it arriving on the morning of that day. Thanks to some delays, Smith did not get Elzey's command, along with the Sixth Norh Carolina, aboard until nearly 3 A.M., 21 July. Obviously fearing that any further wait would make him miss the battle, Smith acompanied Elzey's brigade and, being senior to the Marylander in rank, he effectively took command of the brigade." "On June the 14th, F Company was ordered to Richmond to join a regiment that was being formed there. The men were told it was a crack regiment; our own and a Maryland company commanded by Capt. J. Lyle Clarke, then in Camp Lee, were to be the nucleus, the other companies to be of the same standing." The Confederate Army, 1861-65 (6) Missouri, Kentucky and Maryland, by R. Field and illustrated by R. Hook. Colonel F J Thomas, Maryland Volunteers, assumed command of the Maryland Volunteers serving in Virginia on 17 May, 1861, and the 1st Maryland Infantry was organised, under the command of Colonel A Elzey, Jr., was organised at Camp Johnston, on the Northwestern Turnpike, in the vicinity of J Mason's House or Selma, half a mile west of Winchester, Frederick County, Virginia, on 25 June, 1861. Weston's (Maryland Line) Battalion Infantry was stationed at Camp of Instruction or Lee, Hermitage Agricultural Fairgrounds, between the Richmond, Fredericksburg & Potomac Railroad and Deep Run Turnpike, two miles northwest of the Capitol, Captiol Hill, Richmond, Henrico County, Virginia, on 15 June, 1861. Note: The Weston Guards was accepted in state of Virginia service for one year at Weston & Williams Store, on Pearl Street, Richmond, Henrico County, Virginia, on 16 May, 1861; Clarke's Company for one year on 23 May, 1861; and Robertson's and Murray's Companies for one year on 12 June, 1861. Mustered for one year, Richmond, Henrico County, Virginia, 17 & 23 May & 15 & 18 June, 1861: Weston's (Maryland Line) Battalion Infantry, Company A, was mustered in state of Virginia service for one year at Richmond, Henrico County, Virginia, on 17 May, 1861; Company B for one year on 24 May, 1861; Company C for one year on 15 June, 1861; and Company D on 18 June, 1861. Note: J A Weston was appointed major, Provisional Army of Virginia, at Richmond, Henrico County, Virginia, on 29 May, 1861. Richmond, Henrico County, to Suffolk, Nansemond County, Virginia, Companies C (2nd) & H (2nd), 29 May-6 June, 1861: The Weston Guards and Murray's Company were ordered to proceed by the Richmond & Petersburg Railroad to Suffolk, Nansemond County, Virginia, under the command of Colonel F J Thomas, Provisional Army of Virginia, on 29 May, 1861, and were stationed at Suffolk, Nansemond County, Virginia, between 29 May and 6 June, 1861. The Weston Guards and Murray's Company were ordered to proceed by the Norfolk & Petersburg Railroad to Richmond, Henrico County, Virginia, on 6 June, 1861. Note: A detachment of Maryland Volunteers (150), under the command of Colonel F J Thomas, Maryland Volunteers, arrived at Richmond, Henrico County, Virginia, on 28 May, 1861, and was appointed colonel, Provisional Army of Virginia, on 29 May, 1861. Colonel F J Thomas, Provisional Army of Virginia, was acting chief of ordnance to General J E Johnston, Confederate States Army, on 1 July, 1861, and was killed at the first battle of Manassas on 21 July, 1861. Special Orders No.164, Headquarters, Virginia Forces, Richmond, Henrico County, Virginia, 3 June, 1861: The Weston Guards and Murray's Company were ordered to Harpers Ferry, Jefferson County, Virginia, by Special Orders No.164, Headquarters, Virginia Forces, Richmond, Henrico County, Virginia, on 3 June, 1861. Note: Weston's (Maryland Line) Battalion Infantry, Companies A and D, were assigned to Confederate service by Special Orders No.71, Paragraph IV, Adjutant & Inspector General's Office, Richmond, Henrico County, Virginia, on 14 June, 1861, and the Weston Guards (70) was stationed at Camp Lee, Hermitage Agricultural Fairgrounds, between the Richmond, Fredericksburg & Potomac Railroad and Deep Run Turnpike, two miles northwest of the Capitol, Captiol Hill, Richmond, Henrico County, Virginia, between 11 and 18 June, 1861. Note: Weston's (Maryland Line) Battalion Infantry, Company C, was stationed at Camp Lee, Hermitage Agricultural Fairgrounds, between the Richmond, Fredericksburg & Potomac Railroad and Deep Run Turnpike, two miles northwest of the Capitol, Captiol Hill, Richmond, Henrico County, Virginia, under the command of Major J A Weston, Weston's (Maryland Line) Battalion Infantry, on 9 July, 1861. Major A Elzey, Jr., artillery, Confederate States Army, was appointed colonel, 1st Maryland Infantry, on 18 June, 1861, dated 17 June, 1861, and arrived at Winchester, Frederick County, Virginia, at 2 PM on 24 June, 1861. Point of Rocks, Frederick County, Maryland, Companies A & B, 8 & 9 May, 1861: The Frederick Volunteers, under the command of Captain B T Johnson, arrived at Point of Rocks, Frederick County, Maryland, on 8 May, 1861, and the Baltimore Rifles, under the command of Captain C C Edelin, on 9 May, 1861. The Frederick Volunteers and the Baltimore Rifles were temporarily assigned to Captain T Ashby, Fauquier Mounted Rangers, at Point of Rocks, Frederick County, Maryland, between 9 and 27 May, 1861 (See the 7th Virginia Cavalry). Note: A detachment of Maryland Volunteers (70), under the command of Captain B T Johnson, was stationed at Point of Rocks, Frederick County, Maryland, on 11 May, 1861, and a detachment (200) on 15 May, 1861. First Lieutenant G W Booth, 1st Maryland Battalion Infantry, Company D, arrived by the Baltimore & Ohio Railroad at Harpers Ferry, Jefferson County, Virginia, in the afternoon on 18 May, 1861. Note: The Wise Artillery arrived at Point of Rocks, Frederick County, Maryland, on 27 May, 1861, and Lieutenant Colonel & Assistant Adjutant General G Deas, Confederate States Army, was stationed at Point of Rocks, Frederick County, Maryland, in the evening on 20 May, 1861 (See the Wise Artillery). Harpers Ferry, Jefferson County, Virginia, 18 & 23 May, 1861: The 1st Maryland Infantry was organised at Harpers Ferry, Jefferson County, Virginia, under the temporary command of Captain B T Johnson, 1st Maryland Infantry, Company A, on 18 May, 1861, and Captain G H Steuart, cavalry, Confederate States Army, was assigned to command the 1st Maryland Battalion Infantry on 23 May, 1861. Mustered in for the war, Harpers Ferry, Jefferson County, Virginia, 21, 22, & 23 May, 1861: The 1st Maryland Infantry, Companies A and B, were mustered in Confederate service for the war at Harpers Ferry, Jefferson County, Virginia, by Lieutenant Colonel & Assistant Adjutant General G Deas, Confederate States Army, on 21 May, 1861; Companies C (1st), D, E, G, and H (1st), for the war on 22 May, 1861; and Company F (1st) for the war on 23 May, 1861. Note: The 1st Maryland Infantry, Companies A and B, were stationed at Harpers Ferry, Jefferson County, Virginia, on 27 May, 1861. Maryland Heights, opposite Harpers Ferry, Jefferson County, Virginia, 4 June, 1861: The 1st Maryland Infantry, Company A, and detachments of Companies C, E, and F, under the command of Captain B T Johnson, 1st Maryland Infantry, Company A, were ordered to Maryland Heights, opposite Harpers Ferry, Jefferson County, Virginia, on 4 June, 1861. General Orders No.25, Headquarters Provisional Army of Virginia, 8 June, 1861: General Orders No.25, Headquarters Provisional Army of Virginia, 8 June, 1861, assigned the 1st Maryland Infantry to the Confederate States Army on 1 July, 1861. Evacuation Harpers Ferry, Jefferson County, Virginia, 15 June 1861: The 1st Maryland Infantry evacuated Harpers Ferry, Jefferson County, Virginia, in the morning on 15 June, 1861, and was ordered to proceed by the Smithfield, Charlestown & Harpers Ferry Turnpike to Winchester, Frederick County, Virginia, the same day. The regiment arrived at Charlestown, Jefferson County, Virginia, in the afternoon on 15 June, 1861. Note: The sick of the 1st Maryland Infantry were ordered to proceed by the Winchester & Potomac Railroad to Winchester, Frederick County, Virginia, at 2 PM on 13 June, 1861, and the 1st Maryland Infantry was stationed at Camp Johnston, on the Berryville & Charleston Turnpike, on the North or South Fork of Bull Skin Run, three or four miles west of Charlestown, Jefferson County, Virginia, in the evening on 15 June, 1861. Camp Johnston, on the Berryville & Charleston Turnpike, on the North or South Fork of Bull Skin Run, three or four miles west of Charlestown, Jefferson County, to Mill Creek, a quarter of a mile north of Bunker Hill, Berkeley County, Virginia, 16 June, 1861: The 1st Maryland Infantry was ordered to Bunker Hill, Berkeley County, Virginia, at 9 AM on 16 June, 1861, and arrived at Mill Creek, a quarter of a mile north of Bunker Hill, via Smithfield or Middleway, Berkeley County, Virginia, in the evening the same day. Note: Weston's (Maryland Line) Battalion Infantry, Companies A and D, were assigned to the 1st Maryland Infantry, Companies C (2nd) and H (2nd), under the command of Colonel A Elzey, Jr., on 16 June, 1861. Mill Creek, a quarter of a mile north of Bunker Hill, Berkeley County, to Stephenson's Station, on the Winchester & Potomac Railroad, four miles northeast of Frederick County, Virginia, 17 June, 1861: The 1st Maryland Infantry was ordered to proceed by the Martinsburg Turnpike to Winchester, Frederick County, Virginia, at 2 PM on 17 June, 1861, and arrived at Camp Defiance, Stephenson's Station, on the Winchester & Potomac Railroad, four miles northeast of Winchester, Frederick County, Virginia, in the evening the same day. Note: The 1st Maryland Infantry was assigned to the Third Brigade, Army of the Shenandoah, under the command of Senior Colonel W C Falkner, 2nd Mississippi Infantry, at Mill Creek, a quarter of a mile north of Bunker Hill, via Smithfield or Middleway, Berkeley County, Virginia, on 16 June, 1861 (See the 2nd Mississippi Infantry). Expedition to Harpers Ferry, Jefferson County, Virginia, 19 June, 1861: The 1st Maryland Infantry, under the command of Lieutenant Colonel G H Steuart and Major B T Johnson, was ordered to proceed by the Winchester & Potomac Railroad to Harpers Ferry, Jefferson County, Virginia, on 19 June, 1861. Stephenson's Station, on the Winchester & Potomac Railroad, four miles northeast of Winchester, to Apple Pie Ridge, half a mile northwest of Winchester, Frederick County, Virginia, 20 June, 1861: The 1st Maryland Infantry was ordered to Winchester, Frederick County, Virginia, in the morning on 20 June, 1861, dated PM on 19 June, 1861, and arrived at Camp Bee, on Apple Pie Ridge, half a mile northwest of Winchester, Frederick County, Virginia, the same day. Note: Brigadier General B E Bee, Confederate States Army, was assigned to command the Third Brigade, Army of the Shenandoah, at Camp Bee, on Apple Pie Ridge, half a mile northwest of Winchester, Frederick County, Virginia, on 19 June, 1861. Camp of Instruction or Lee, Hermitage Agricultural Fairgrounds, between the Richmond, Fredericksburg & Potomac Railroad & Deep Run Turnpike, two miles northwest of the Capitol, Captiol Hill, Richmond, Henrico County, to Winchester, Frederick County, Virginia, Companies C (2nd) & H (2nd), 23-24 June, 1861: Weston's (Maryland Line) Battalion Infantry, Companies A and D, were ordered to proceed by the Virginia Central Railroad to Winchester, Frederick County, Virginia, in the morning on 23 June, 1861, and were accompanied by Colonel A Elzey, Jr., 1st Maryland Infantry. Companies A and D arrived by the Manassas Gap Railroad at Strasburg, Shenandoah County, via Manassas Junction, Prince William County, Virginia, in the evening the same day and were stationed at Strasburg, Shenandoah County, on 23 June, 1861. Weston's (Maryland Line) Battalion Infantry, Companies A and D, were ordered to proceed by the Valley Turnpike to Winchester, Frederick County, Virginia, in the morning on 24 June, 1861, and arrived at 2 PM the same day. Note: Weston's (Maryland Line) Battalion Infantry, Companies A and D, arrived at Camp Johnston, on the Northwestern Turnpike, in the vicinity of J M Mason's House or Selma, half a mile west of Winchester, Frederick County, Virginia, on 24 June, 1861, and were assigned to the 1st Maryland Infantry, Companies C (2nd) and H (2nd), respectively, at Camp Johnston, in the vicinity of J M Mason's House or Selma, half a mile west of Winchester, Frederick County, Virginia, on 25 June, 1861. Camp Bee, Apple Pie Ridge, half a mile northwest of Winchester, to J M Mason's House or Selma, half a mile west of Winchester, Frederick County, Virginia, 24 June, 1861: The 1st Maryland Infantry arrived at Camp Johnston, in the vicinity of J M Mason's House or Selma, half a mile west of Winchester, Frederick County, Virginia, on 24 June, 1861, and the 1st Maryland Infantry, Companies C (1st), F (1st), and H (1st), were disbanded and assigned to the 1st Maryland Infantry at Camp Johnston, on the Northwestern Turnpike, in the vicinity of J M Mason's House or Selma, half a mile west of Winchester, Frederick County, Virginia, on 25 June, 1861. Note: The 1st Maryland Infantry was assigned to the Fourth Brigade, Army of the Shenandoah, under the command of Colonel A Elzey, 1st Maryland Infantry, at Camp Johnston, on the Northwestern Turnpike, in the vicinity of J M Mason's House or Selma, half a mile west of Winchester, Frederick County, Virginia, on 24 June, 1861, and the 1st Maryland Infantry, Company F (2nd), under the command of Captain J L Smith, was assigned to the Maryland Infantry at Camp Johnston, on the Northwestern Turnpike, in the vicinity of J M Mason's House or Selma, half a mile west of Winchester, Frederick County, Virginia, on 25 June, 1861. Camp Johnston, on the Northwestern Turnpike, in the vicinity of J M Mason's House or Selma, half a mile west of Winchester, Frederick County, Virginia, to Darkesville, Berkeley County, Virginia, 2-3 July, 1861: The 1st Maryland Infantry was ordered to proceed by the Valley Turnpike to Darkesville, Berkeley County, Virginia, at 12 PM on 2 July, 1861, and arrived via Bunker Hill, Berkeley County, Virginia, at 10 AM on 3 July, 1861. Darkesville, Berkeley County, Virginia, 7 July, 1861: The 1st Maryland Infantry was ordered to Winchester, Frederick County, Virginia, in the morning on 7 July, 1861, and arrived at at Camp Johnston, in the vicinity of J M Mason's House or Selma, half a mile west of Winchester, Frederick County, Virginia, 5 PM the same day. Note: The 1st Maryland Infantry was ordered to the tollgate on the Martinsburg Turnpike, three-quarters of a mile north of Winchester, Frederick County, Virginia, on 15 July, 1861. The 1st Maryland Infantry was ordered to Manassas Junction, Prince William County, Virginia, by Special Orders No.1, Headquarters, Army of the Shenandoah, Winchester, Frederick County, Virginia, at 1 AM on 18 July, 1861, dated 17 July, 1861. Camp Johnston, on the Northwestern Turnpike, in the vicinity of J M Mason's House or Selma, half a mile west of Winchester, Frederick County, to Piedmont Station, Fauquier County, Virginia, 18-19 July, 1861: The 1st Maryland Infantry was ordered to proceed by the Millwood Turnpike to Piedmont Station, Fauquier County, Virginia, at 5 PM on 18 July, 1861, and arrived at Berry's Ferry, on the Shenandoah River, three and a half miles southeast of Millwood, Clarke County, Virginia, at 7 AM on 19 July, 1861. The regiment was ordered to across the Shenandoah River at Berry's Ferry, three and a half miles southeast of Millwood, Clarke County, Virginia, at 9 AM the same day and arrived at Piedmont Station via Ashby's Gap, Paris and Upperville, Fauquier County, Virginia, at 10 PM on 19 July, 1861. Piedmont Station, Fauquier County, to Manassas Junction, Prince William County, Virginia, 21 July, 1861: The 1st Maryland Infantry was ordered to proceed by the Manassas Gap Railroad to Manassas Junction, Prince William County, Virginia, at 5 AM on 21 July, 1861, and was accompanied by the 3rd Tennessee Infantry, the 10th Virginia Infantry, and the 13th Virginia Infantry, Companies E, F, G, H, I, and K, under the command of Brigadier General E K Smith, Confederate States Army, (See the Fifth Brigade, Army of the Shenandoah). The regiment arrived at Camp Pickens, Manassas Junction, Prince William County, Virginia, at 1 PM the same day. Note: Brigadier General E K Smith, Confederate States Army, assumed command of the Fourth Brigade, Army of the Shenandoah, at Piedmont Station, Fauquier County, Virginia, in the morning on 21 July, 1861. After the first battle of Manassas the 1st Maryland Infantry arrived at Camp Walker, on the Orange & Alexandria Railroad, one and a half miles southwest of McLean's Ford, on the Bull Run River, the evening on 21 July, 1861. Camp Walker, on the Orange & Alexandria Railroad, one & a half miles southwest of McLean's Ford, on the Bull Run River, to Fairfax Courthouse, Fairfax County, Virginia, 23 July, 1861: The 1st Maryland Infantry was ordered to Fairfax Courthouse, Fairfax County, Virginia, at 2 AM on 23 July, 1861, and was accompanied by the 3rd Tennessee Infantry, the Loudoun Artillery, and the 1st Virginia Cavalry. The regiment arrived at Fairfax Courthouse, Fairfax County, Virginia, at 12 PM the same day. Note: The 1st Maryland Infantry was stationed at Fairfax Courthouse, Fairfax County, Virginia, on 25 July, 1861. Fairfax Courthouse to Fairfax Station, Fairfax County, Virginia, 2 August, 1861: The 1st Maryland Infantry was ordered to Fairfax Station, Fairfax County, Virginia, on 2 August, 1861. Richmond, Henrico County, to Fairfax Station, Fairfax County, Virginia, Company I, 31 July & 21 August, 1861: The 1st Maryland Infantry, Company I, was stationed at Camp Lee, Hermitage Agricultural Fairgrounds, between the Richmond, Fredericksburg & Potomac Railroad and Deep Run Turnpike, two miles northwest of the Capitol, Captiol Hill, Richmond, Henrico County, Virginia, on 30 July, 1861, and was ordered to proceed by Virginia Central Railroad to Manassas Junction, Prince William County, Virginia, by Special Orders No.238, Paragraph II, Headquarters, Virginia Forces, Richmond, Henrico County, Virginia, on 31 July, 1861. The company arrived at Fairfax Station, Fairfax County, Virginia, on 21 August, 1861. Note: The 1st Maryland Infantry, Company I, was stationed at Richmond, Henrico County, Virginia, on 9 July, 1861, and was assigned to guard Federal prisoners captured at the first battle of Manassas at Richmond, Henrico County, Virginia, between 23 and 31 July, 1861. Mustered out, Richmond, Henrico County, Virginia, 17 August, 1862: The 1st Maryland Infantry was disbanded on 11 August, 1862, and was mustered out at Richmond, Henrico County, Virginia, on 17 August, 1862. Colonel A Elzey, 1st Maryland Infantry, Fourth Brigade, Army of the Shenandoah: Captain A Elzey, Jr., 2nd United States Artillery, Light Company E, resigned on 3 March, 1861, and was appointed major, artillery, Confederate States Army, on 18 May, 1861, dated 16 March, 1861 (See the 2nd United States Artillery, Light Company E). Major A Elzey, Jr., artillery, Confederate States Army, was assigned to mustering duty at Atlanta, Fulton County, Georgia, by Special Orders No.57, Paragraph IV, Adjutant & Inspectors General's Office, Montgomery, Montgomery County, Alabama, on 23 May, 1861, and was appointed colonel, 1st Maryland Infantry, at Richmond, Henrico County, Virginia, on 17 June, 1861. Colonel A Elzey, Jr., 1st Maryland Infantry, was assigned to command the Fourth Brigade, Army of the Shenandoah, at Camp Johnston, in the vicinity of J M Mason's House or Selma, half a mile west of Winchester, Frederick County, Virginia, on 24 June, 1861, and was appointed brigadier general, Confederate States Army, on 26 August, 1861, dated 21 July, 1861. Lieutenant Colonel G H Steuart, 1st Maryland Infantry: Captain G H Steuart, 1st United States Cavalry, Company K, resigned on 22 April, 1861, and was appointed captain, cavalry, Confederate States Army, at Richmond, Henrico County, Virginia, on 24 May, 1861, dated 16 March, 1861. 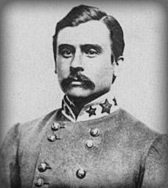 Captain G H Steuart, cavalry, Confederate States Army, was temporarily assigned to command the 1st Maryland Infantry, at Harpers Ferry, Jefferson County, Virginia, on 23 May, 1861. The 1st Maryland Infantry was assigned to the Fourth Brigade, Second Corps, Army of the Shenandoah, under the command ofBrigadier General A Elzey, Jr., Confederate States Army, on 25 September, 1861.